That last basket (#4) was a doozy! I would repurchase almost every tart in there... yikes. Here they are: RG- Snowflake and Frosted Streuselkuchen, SMT- Sweet Lavender Mallow Cake/Pink Vanilla Butter Fudge and Pink Noel/Orange Chiffon Cake this one I am excited to have coming in my March 31st order, it is really strong and the scent is the sweetest vanilla cake with orange zest accents and vanilla musk, TTT- Hot Pink Serendipity this was in her new scent shot, the throw was great and the scent was a lime rich serendipity, tropical, UTC- American Cream this one threw super strong all day long and into the night, 12 hours easy, beautiful sweet floral and musk scent, TBG- Beach Bum even after being a year old it was still pretty strong and nice, Coppertone feel, Beezy- Strip 'N Go Naked bright, strong lime and fruit punch scent, happy fruity margarita time. This basket is smaller since we will be leaving for vacation soon and many of these have multiple uses. I will still be posting as regular. 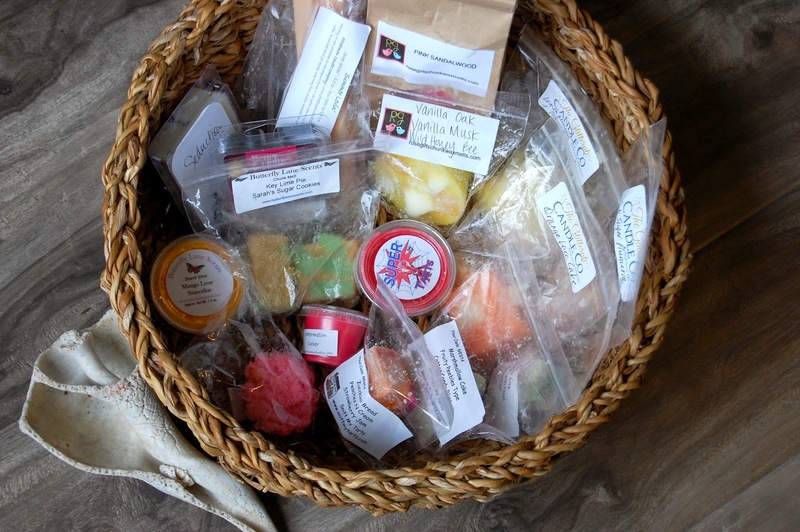 If you are curious about any of these scents or previously melted scents in prior baskets please ask! Today marks The Mermaid's one month on the interwebz! I only used one chunk each from the RG bags :-) now that I am home for the summer I melt a lot more than I would during the school year. My stash is turning over nicely. Making lots of room for my SMT and RG orders. I will report back on the watermelon cooler. I will melt it tomorrow. Happy bonfire time! One month already?! That doesn't even seem possible. I melted 2 cubes of BHG orchid in my bedroom and it was very nice. Strong, long lasting fruity floral. I also melted orange lace cake today in kitchen. Very strong and thick like caramel. A rich orange cake for sure! Nothing light and lace like about it. I enjoyed both. Thank you Deb! Hope you have a good night. Yay, congrats on the one month!